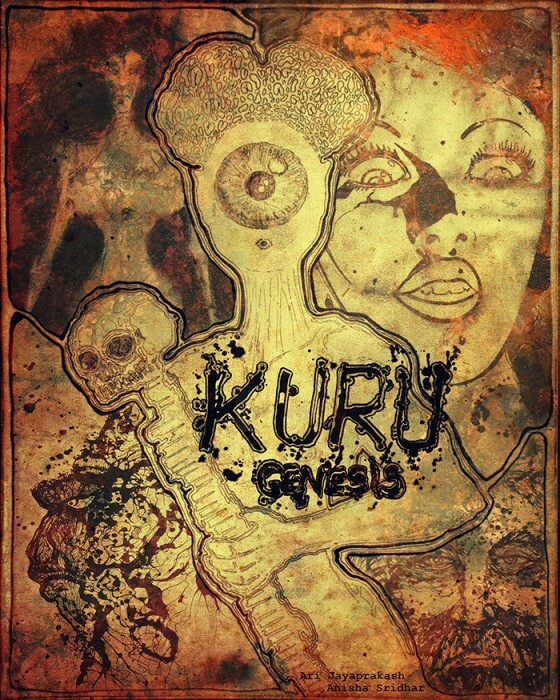 Kuru Genesis serves as a prelude to the upcoming novellascape 'The Kuru Chronicles' which releases later this year. The book includes chapters, panels,concept art, visions and words behind the KuruChronicles.It features the art and philosophy behind the chronicles from the four books of Kuru; Nasadiya, Soma, Aghora and Yuga. The Kuru journey involved expeditions to The Ganga Sagar Mela in Bengal, The Ambubachi Mela at Kamakhya, Assam, Tanjore, Calcutta and a lot of other places. The city of Calcutta, where the artist - ARI JAYAPRAKASH lived for years and where the story is set serves as a major inspiration. The original art of The Kuru Chronicles traveled the length and breadth of India across various music and art festivals including venues at Rishikesh, New Delhi, Bangalore, Bombay, Calcutta, Madras, Naukuchiatal amongst others. The art of Kuru is not your standard graphic novel offering. The style is splash ink art on paper that has been treated with tea and coffee. In the end the paper edges are burnt as offerings to Agni and sometimes additional shading is done using fire and water. Materials include A3 size drawing sheets, black/red ink and a calligraphy pen. "It is Ari's avant-garde art and the Tantric theme which inspired me to write the article. He also became the first Indian artist to be featured on Heathen Harvest! - Ankit Sinha"